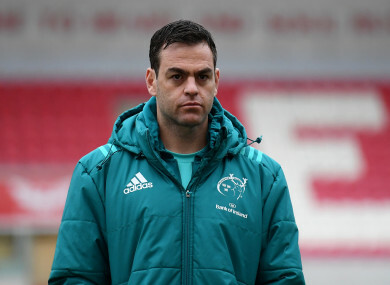 Munster head coach, Johann van Graan. JOHANN VAN GRAAN insists Munster are “still in a brilliant place” despite their defeat to the Scarlets. In driving Welsh rain, it was the hosts who came out on top as Munster failed to turn their dominance of territory and possession into points. The visitors’ only points came via a pair of Bill Johnston penalties, but their head coach wasn’t too downbeat. “The conditions were very tough,” Van Graan said. “I thought we did a lot of good stuff in that game and it’s very frustrating not to score those tries. We were literally half a metre away twice and we also had a disallowed try. They were big moments in the game, but all credit to the Scarlets and their defence. “I thought they defended very well and their try was also a call by the TMO – but [it was] a brilliant offload. That was the difference in the game. We did enough to win it, but credit to the Scarlets. We are still in a brilliant place. “We want to win every single game we play, but to come to Wales two weeks in a row in difficult conditions is very tough. “We managed to pull off a win against the Ospreys last week and this time we were one decision away from making it two in-a-row. We’ve got a confident group of players in our squad and the internationals will come back now for the game with Zebre after the Six Nations and then it’s a European Cup quarter-final with Edinburgh. Munster trailed 7-6 at the break and failed to score another point. Johnston opened the scoring, but the Scarlets responded when the outstanding Leigh Halfpenny collected a high ball, ran it back, and from there Johnny McNicholl’s sublime offload sent his fellow wing Ioan Nicholas over to score. Halfpenny converted via an upright. Johnston did kick another penalty, but Munster couldn’t make the most of their utter dominance of territory and possession. In the second period Halfpenny kicked a penalty, but Munster had a score ruled out when Jean Kleyn went over. Rhys Marshall was penalised for blocking by the television match official. Munster went close on so many occasions it was incredible they didn’t score and on each occasion they either knocked on under pressure from Scarlets tacklers or made individual errors. Halfpenny was outstanding in defence for the hosts and Uzair Cassiem made 30 tackles. On Kleyn’s disallowed try, Van Graan added: “It was a difficult call. Unfortunately it went against us and I’m not going to moan about it. Email “Van Graan insists Munster 'still in a brilliant place' despite Scarlets defeat”. Feedback on “Van Graan insists Munster 'still in a brilliant place' despite Scarlets defeat”.